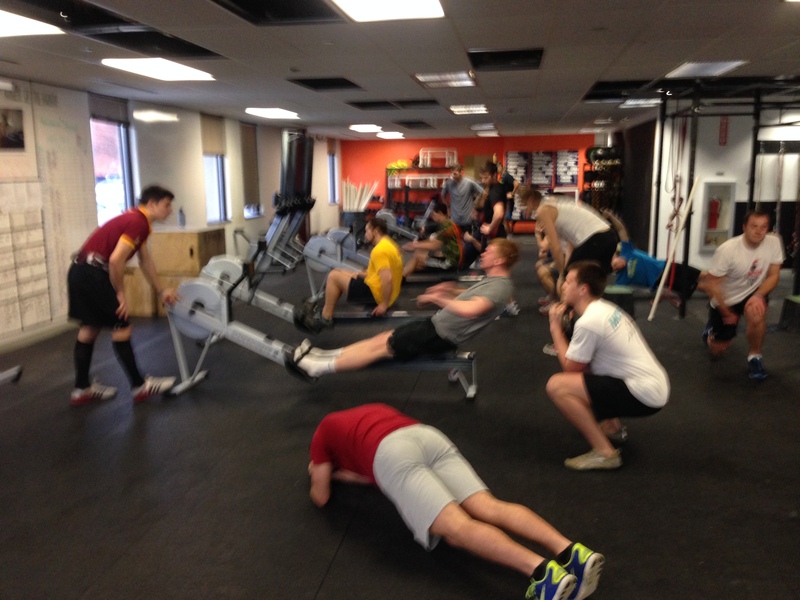 BC Men’s Crew getting after some Calories, Planks, and Goblet Squats this week. Post Goal Split for CRASH-B’s and Results to Comments. If you’re looking for an edge in Tabata This, Fight Gone Bad, or simply your Tabata Row, today’s Rowing WOD is the perfect opportunity to build your consistency on shorter pieces. The focus is maintaining race pressure and mentally executing a race plan. The goal is to be consistently strong through all 10 pieces. During the 20 seconds off, paddle lightly at a stroke rating of 14 – 16 to recover. Focus on your breathing and form. The first two pieces should be executed like the start of a 2k race; sprint start, high ten, then settle to an efficient race pace. The second three pieces should focus on holding a consistent race pace and stroke rating, around 32 for vets and 28 for novices. The third section represents the third 500 of the 2k where mental toughness is key to keep the split from jumping up. The last two pieces are an opportunity to either practice your sprint to the finish line or hold strong if you’re really feeling it. When finished you will have 10 data points you can compare to see where extra focus will be required during your next 2k or first 2k if you’ve never done one! CRASH-B’s are about two weeks away! Really dial in your game plan and attack each piece. This is when you should have your race plan dialed in and really get comfortable with pulling the splits you plan to hold during the race. Focus on consistency and make every single stroke count. When you attack Jackie pick a challenging split and stroke rating to hold, but make sure you’re able to remain efficient and fresh enough to perform the thrusters and pull ups at full intensity. Try to focus on your rhythm and ratio to allow for breathing and recovery every single stroke. Get after it and have a solid day of training! Try to improve your “Jackie” time from last week! This entry was posted in Fitness, Rowing, Strength and tagged endurance sports, exercise, functional movements, healthy-living, mental toughness, row 2k, rowing, sports, training by Renegade Rowing. Bookmark the permalink.